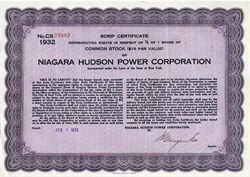 Beautifully engraved certificate from the Niagra Hudson Power Corporation issued in 1933. This historic document was printed by American Bank Note Company. This item is over 74 years old.